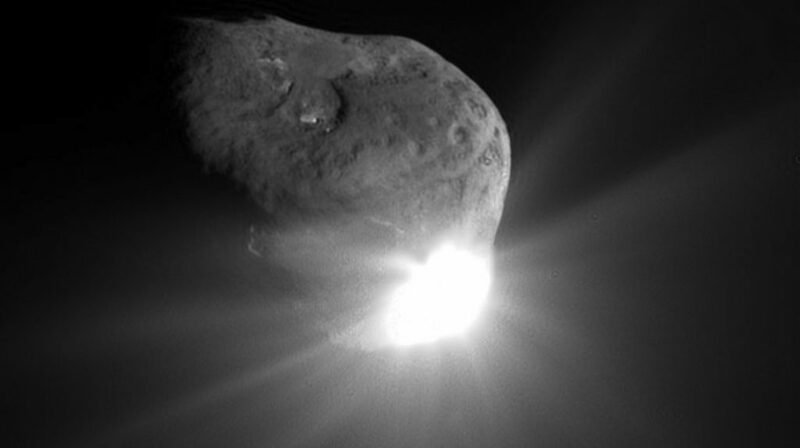 An asteroid of approximate size of a minimoon, c/o NASA. For nearly four billion years, Earth and the Moon have been inseparable as they’ve journeyed together through the cosmic void. It’s our only permanent satellite we’ll ever know. But new research has unearthed (…unmooned?) evidence that our planet occasionally captures “mini-moons” every once in a while. These tiny asteroids zoom around our planet as temporary natural satellites. The existence of mini-moons was thought to be unlikely by a number of astronomers and even impossible because current data and asteroid surveys had shown no sign of natural geocentric objects in orbit. It’s possible that due to the incredibly small relative size of these objects, which are often moving too fast and are sometimes faulty labeled artificial – the discovery of mini-moons had continued to elude us. Our Moon is roughly a quarter the size of our planet, which makes mini-moons infinitesimally small in comparison. These fast-moving and transient objects are difficult to detect, even though there may be loads of them floating around the planet. Mini-moons usually measure anywhere from 3 to 10 ft in diameter. Sometimes they’ll elope with our orbit for just a quick swing before going right back to revolving around the sun. There is still a lot to learn about these objects. Twelve years ago, the first and only other mini-moon was detected by astronomers by the Catalina Sky Survey organization. It was named 2006 RH120 and measured to be 6 to 10 ft in length. It’s thought to enter Earth’s orbit around every 20 years. It remains our only known mini-moon for now. It’s expected that in the near future, advances in astronomical surveys will allow us to discover even greater quantities of mini-moons. Options for establishing a candidate as natural include obtaining spectra or colors, radar observations, or measuring its area-to-mass ratio (AMR) based on the magnitude of the effect of solar radiation pressure on its trajectory. Obtaining sufficiently high signal-to-noise ratio (SNR) spectra of small, faint, fast objects is notoriously difficult and even low-resolution color photometry could require large telescopes and a disproportionate amount of observing time. Discovering a little teeny mini-moon might seem minuscule, but this research might help us better understand the nature of asteroids around the solar system, Earth-to-moon system relations and a whole host of other commercial and celestial data.